Chervone has got its own status as ' a village of a town type' since 1938. In the past Chervone was known with its narrow-gauge railway track, which was built for the needs of sugar plant (factory) and connected the village to a major railway track, Kozyatyn -Kyiv. The railway had been closed while back. At present, the nearest station is in Andrushivka. The village as the people has its own biography and own life. 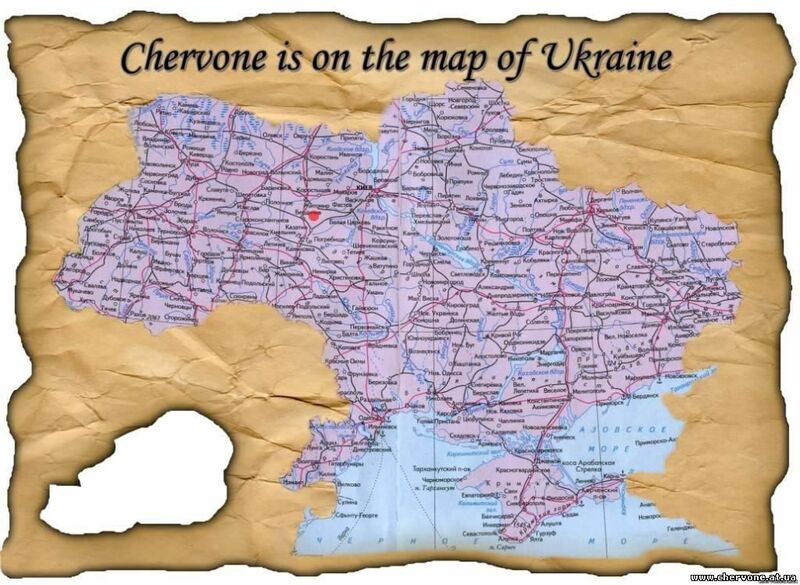 Where has the name of village, Chervone, derived from? A very long ago, when the Mongol-Tatars attacked the village and unleashed the bloody fight, that night the moon lit up the area of the battle and everything around appeared in burning red colour. 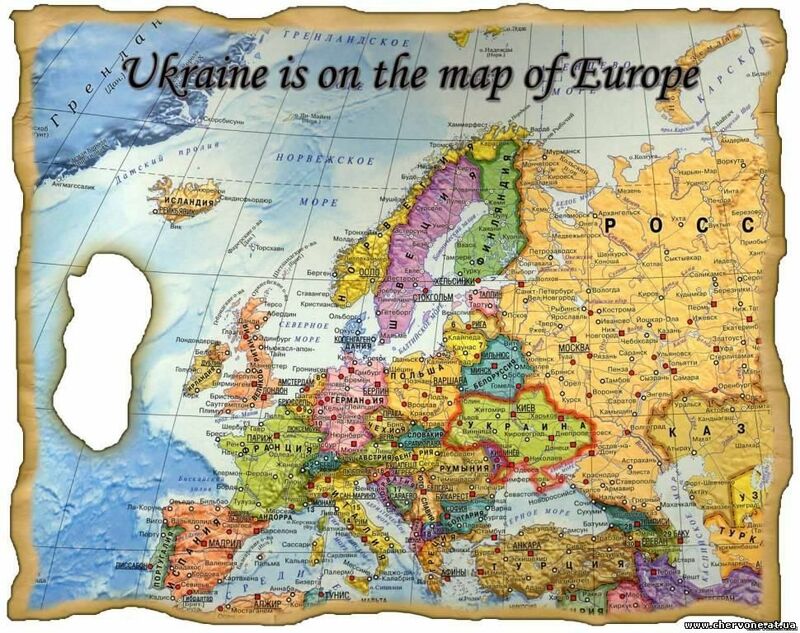 And the colour 'red' in Ukrainian is 'chervone(iy/a)'. So, it's believed that's how the village, Chervone, got its name. Other legend says that the village was widely known by its great opened markets. Even the Byzantine merchants were coming here. One merchant was so amazed by the presence of red colour on the market that he let out a scream: "Oh! How red it is!" Since then it was said "Let's go to Chervone (Red) to get red linen". Rich local soil contained many mineral resources. And one of them was wonderful red clay. People were coming to get that wonder from different parts of the village and used it to decorate their homes. 'Red' houses were visible from distance. So, maybe that was the reason to name the village Chervone (Red). ''The village Chervone is mentioned in the act from 17 December 1737. There were arrests of noblemen and peasants in Belopoliya and Kashperovka villages. Noblemen and peasants attacked Chervone village and killed noblemen Feniamin Tret'yak here (Archives p.3. t.3. st. 273). Until the reform of 1861, the habitants of the village were mostly peasants. Workers appeared with the appearance of factories. Main employment for peasants was agriculture and farming. 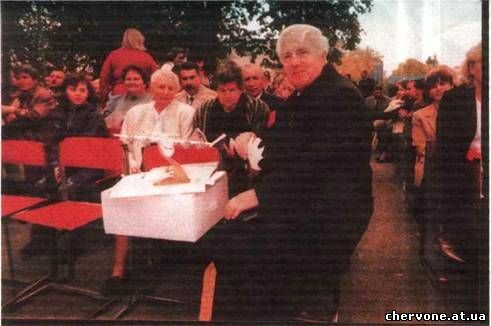 Polish magnate, Earl Grokhol'skiy owned all of Chervone's lands in the middle of ХIХ century. He was the member of Polish Seym. 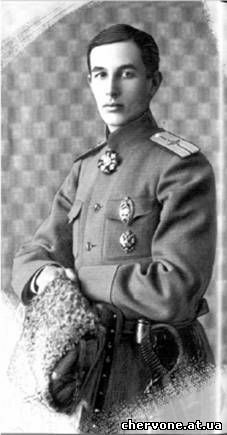 Earl Grokhol'skiy took an active part in insurrection against Tsar under the guidance of Kostyushko. After insurrection was put down all participants were either killed or jailed. All of the properties of earl of Grokhol'skiy were confiscated to tsar's treasury. 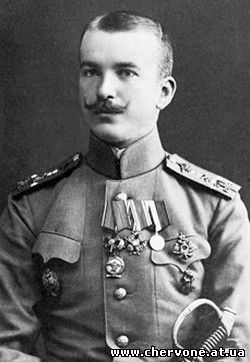 In the period of Russian -Turkish war one of the landlords, from the city of Glukhov of the Chernigov area, M.A Tereshchenko became very rich. He supplied food and feedstuff for the Russian army. After the end of the war, Mihail Artemovich Tereschenko was allowed to purchase Chervone's lands (which were confiscated from Earl Grokhol'skiy) at the favorable price. There were 5087 adults in Chervone in 1909. Plus 509 children, aged between 8-11 (School system Volin region, fund №147, year –1910 list №1, line 400, 1909 year, page. 120). -7 others (fund №158, list №1, Berdychiv office). In 1990 there were 3484 people living in Chervone. Latest census showed the figure of 2800 residents in Chervone at present. Before the Great October Revolution there were such industries as: sugar manufactory, distillery, steam mill, brick yard, electric power station of 25 h.p., bake-house, stud farm (Krasivka), airplane workshop in Chervone. Airplane workshop was opened in 1910. 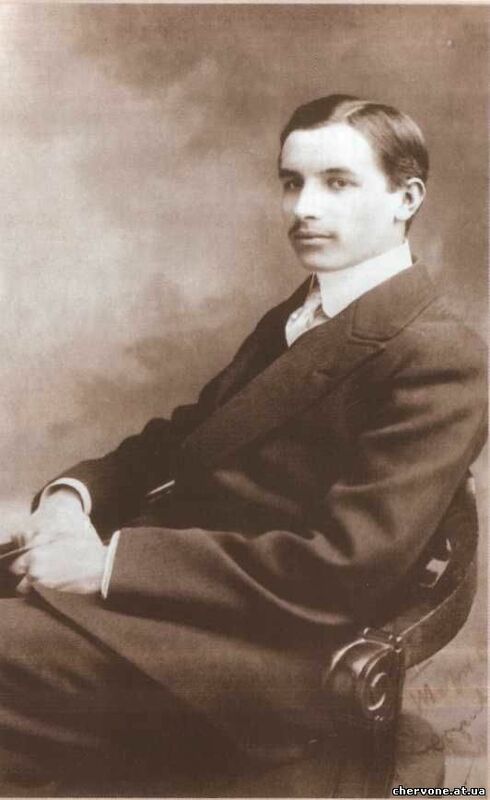 Fedor Fedorovich Tereschenko (1888-1950) became the owner of sugar manufactory on the end of ХIХ century. F.F. Tereshchenko was a highly educated young man. He loved comfort, nature and art. He could draw and sketch beautifully. But he was most interested in aircraft construction. 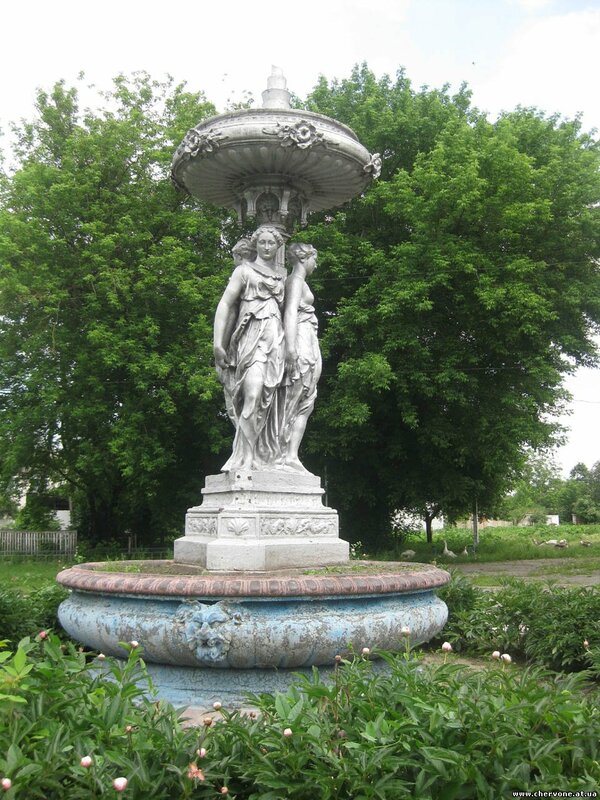 According to his project a wonderful park and an orchard were developed and planted in Chervone. The beautiful linden alley has been saved up until now. The length of it is 250 meters. 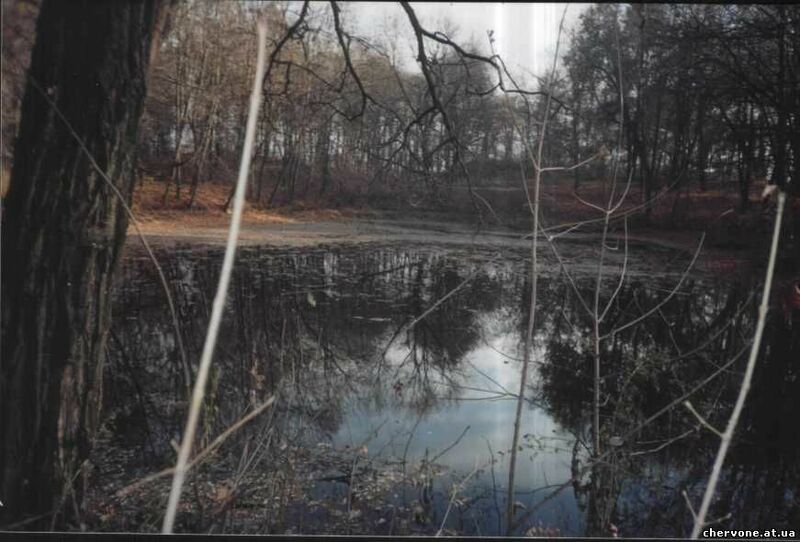 Two lakes in the park were well maintained with crystal clear water and used to host gorgeous swans. In the middle of one of the lakes was a cute heart-shaped island. Unfortunately, the lakes are hidden in the shade of the trees and the little island is dislocated now. F.F. Tereshchenko in1910 year built aircraft workshops not far from his palace in Chervone. He began to construct monoplanes. Monoplane is an airplane or glider with one wing. Glider is an airplane without an engine. L.O. Galanchikova was the first who tried to fly those aircrafts, which were built there. 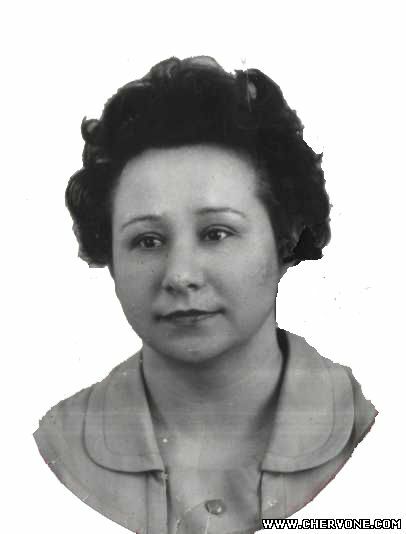 Ljubov Aleksandrovna Galanchikova had a special professional intuition and could identify whether the aircraft was able or not to fly. She was a Russian sportswoman pilot. 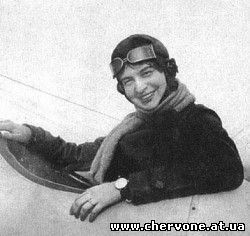 I, Ljubov Aleksandrovna Galanchikova, who's signed this contract, obligate to fly only the aircrafts, which would be given to me from Chervone's aircraft workshops during the period of one year. I have no authority to fly any other aircrafts during this time. Army pilots started visiting our village, which wasn't well known before. One of the most famous pilots, Nesterov (1887-1914) came here. 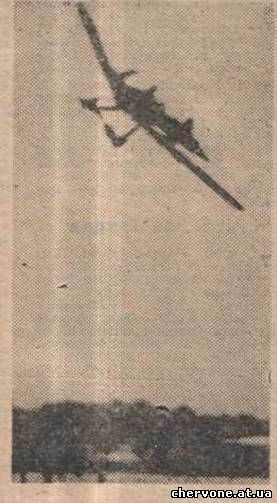 He was the first pilot who carried out a loop in the air. This difficult trick was named after him and it's called " The loop of Nesterov". There are many materials in our school museum, which tell about aircraft construction in Chervone village. Andrushivskiy sugar factory was built in 1848. It was one of the first sugar factories in the Ukraine. The sugar factory got under the guidance of Tereschenko. Tereschenko converted his forest and bakery businesses into perspective saccharine business. Sugar plant labors were supported by the Tsar's government in 1880s. They were united in a syndicate. They set monopolistic high price on sugar and got great profit. Technical progress developed quickly. It enabled them to get considerable income. In Spring 1909 Fedor Fedorovich Tereschenko began to build his own airplane workshop. He had money, possibility and enthusiasm. F.F. Tereschenko was very rich by then. He inherited 1/3 part of property of Fedir Artemovich Tereschenko. He got 19 thousand parts of land and 15 residential estates. According to the data from the main accountancy office, F.F. Tereschenko's threshold was 8.623.784 karbovantsiv. The airplane workshop was in Chervone village, Zhytomyr district, Volunska province. Not far away from it there was an aerodrome, which was also built by Fedor Fedorovich. This was a field area of 41 hectares. 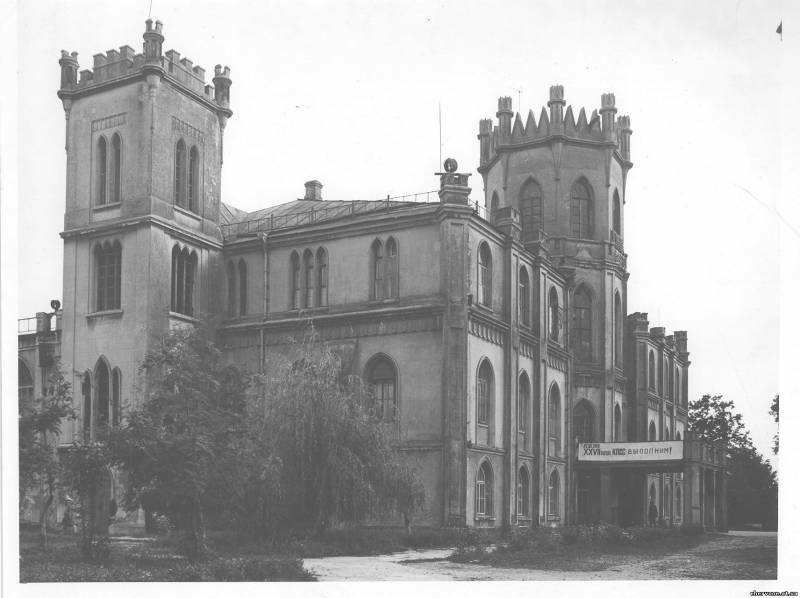 Tereschenko invested almost 150 thousand into the workshop between 1910-1915. He also spent 720 thousand to build the houses and other buildings were his workers, designers and airmen resided. In 1913 25 people worked in the workshop. 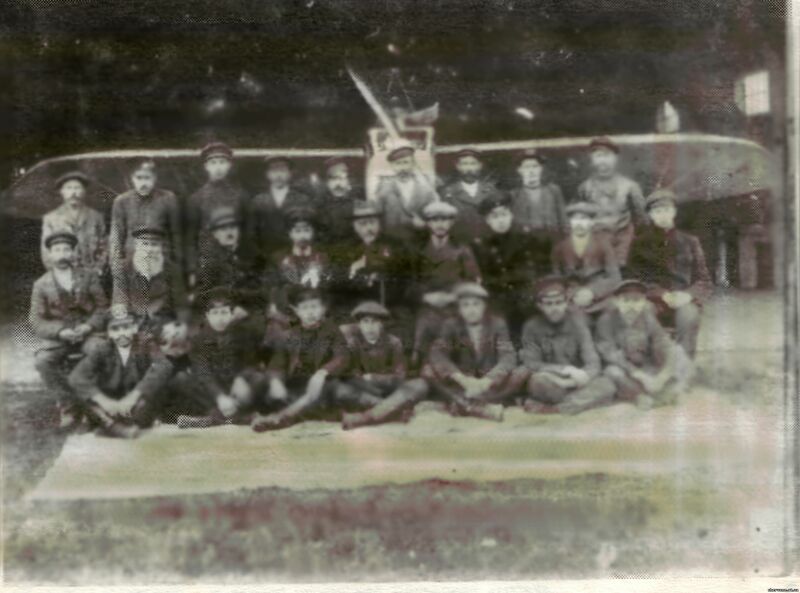 18 were labor workers and 7 were office workers. The labor-workers' salary was 5 thousand 942 krb and 79 cop, and office workers was 16 thousands 519 rub. The first flying aircraft arrived from France in May 1909. Then Fedir Tereschenko decided to build his own airplane according to his ideas and design. The first airplane was ready by 25th December 1909. It was a type of L.Blerio's monoplane. After it 21 year old F. Tereschenko went to France to study aircraft business with L.Blerio. On the 2nd of August 1910 he passed the exam and was awarded a title of a pilot-aviator. So the first graduated pilot appeared in Kyiv. In 1910 Tereschenko created a device for connecting wooden parts in the airplane. This device was registered by his name ''F.F. Tereschenko'', and so the new model of airplane "Tereschenok-2" appeared. In August 1913Tereschenko demonstrated his "Tereschenko-3" model. Next spring another new model came out. It was a monoplane with soft wings and 40powered strong engine. His fifth model weighed only 330 kg and the length of fuselage was 7,1 m, and the scope of wings- 10 m. It could carry a load of 150 kg, and could go up to 2 thousand meters high. The advantage of the model was in the self-triggering system that allowed a pilot to bring up the plane without any additional help. In 1913 Tereschenko began to build airplanes, which were ordered by military ministry. These exclusive orders cost 792.633 rubs. At the end of August, 1915 workshop's equipment was sent to Moscow where it was not only used to make airplanes, but also gun machine settings, bombers and other weapons. 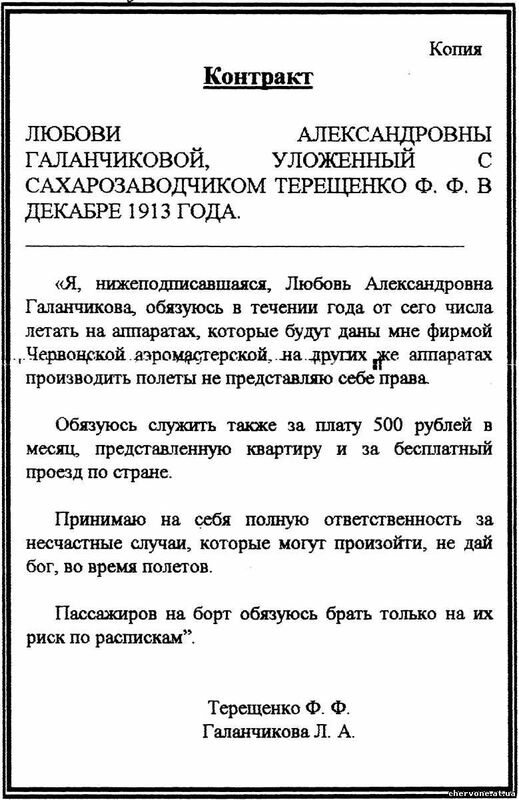 In 1916 Tereshchenko sold all of the equipment, which was transferred to the joint-stock company "Duks" in Russia under management of A. Farmana. In Autumn, 1916 a new model called, "Tereschenko-7", was constructed in Kiev's Polytechnic Institute under the technical guidance of V.P. Grigor'eva. This machine was taken to the military sources. This was the last airplane for two persons, which sped up to 150 km per hour. This was the most perfect model of his airplanes and the last machine of F.F. Tereschenko. After the Great October Revolution Tereschenko emigrated abroad. And who knows, possibly, here, in the Ukraine F.F Tereschenko would develop his talent up to the highest standards and could be in the line with well known USSR aircraft designers, such as Tupolev, Yakovlev, Mikoyan, Korolev etc. Chervone is 15 km far from its district center, Andrushivka, and 19 km far from the railhead Chernorudka. 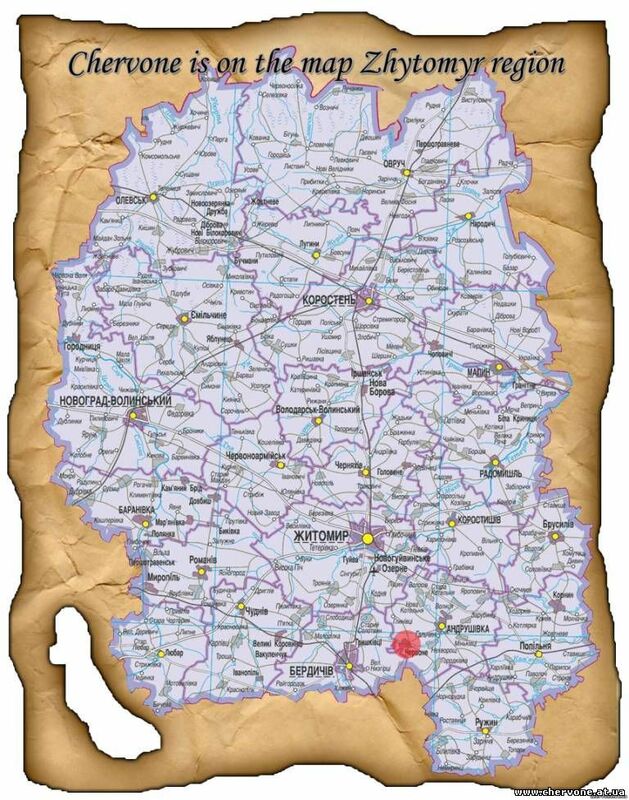 The village was part of Solotvinskoy volost of the Zhytomyr district in the Volhynia province until 1923. For many years Chervone belonged to the noble polish dynasty. Tishkevichi ruled here in XVII century. 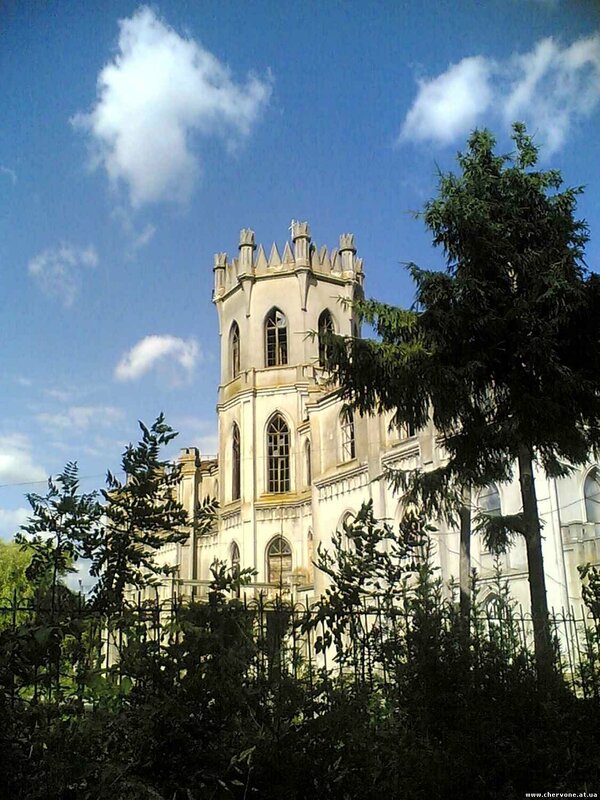 The magnate Francishko Ksaveriy Grohol'sky with his wife Khelena Loshnitska ruled here in XVIII century. After F.K. Groholsky's death in 1792, his son Jan Nepomutsen took over the lead. After Jan died, his son Adol'f continued. 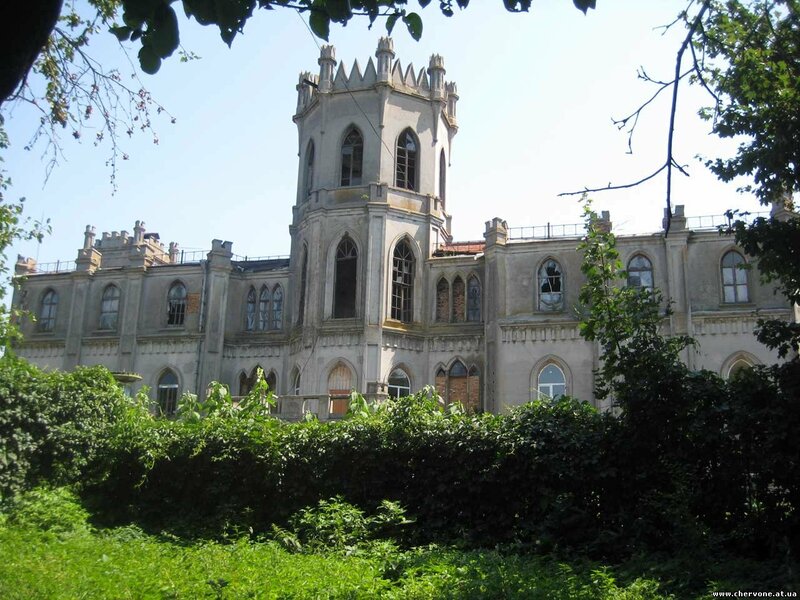 It was Adol'f Grohol'sky who built a large Neogothic residence in the village according to the project of unknown architect. This was a symmetric three-storied palace in a shape of stretched quadrangle with eight-sided tower on a main facade and two quadrilateral towers added to the side facades. Adol'f Grokhol'sky died in 1863. Chervone was inherited by his second wife Vinda Rodziviliv Grokhol'ska. But a widow sold Chervone soon after to Mykolai Tereschenko and went abroad. 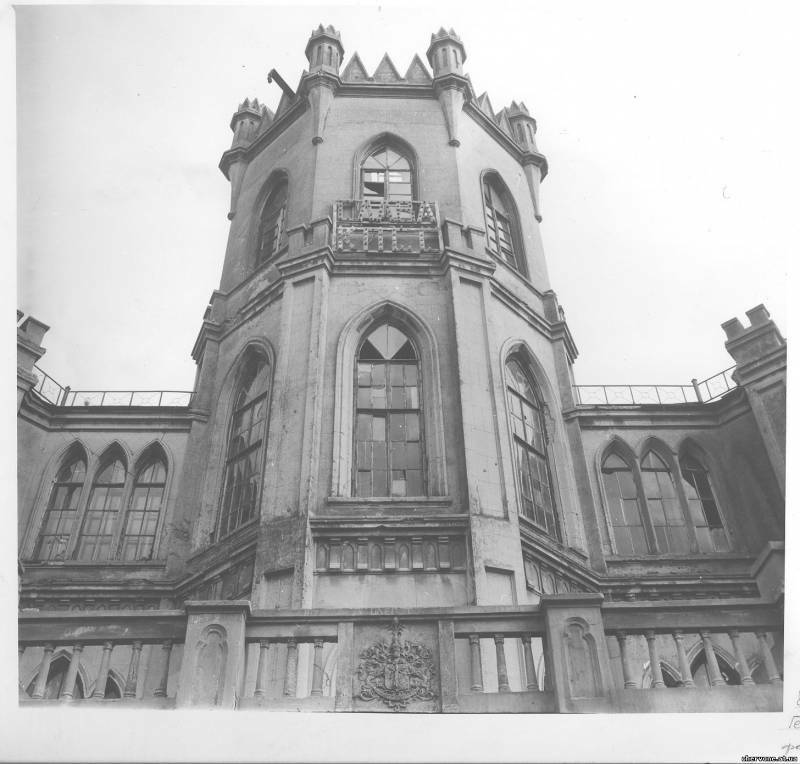 Tereschenko's family reconstructed the palace, especially from the side of the garden. The building got unusual special character. Natalia Tereschenko's maiden name was Uvarova. The letter 'U' is "У" in Ukrainian. A large bearing "У" has been engraved on one of the palace's walls and looks quite mistrial. The palace is surrounded by old trees and its central tower has a crown shaped top. 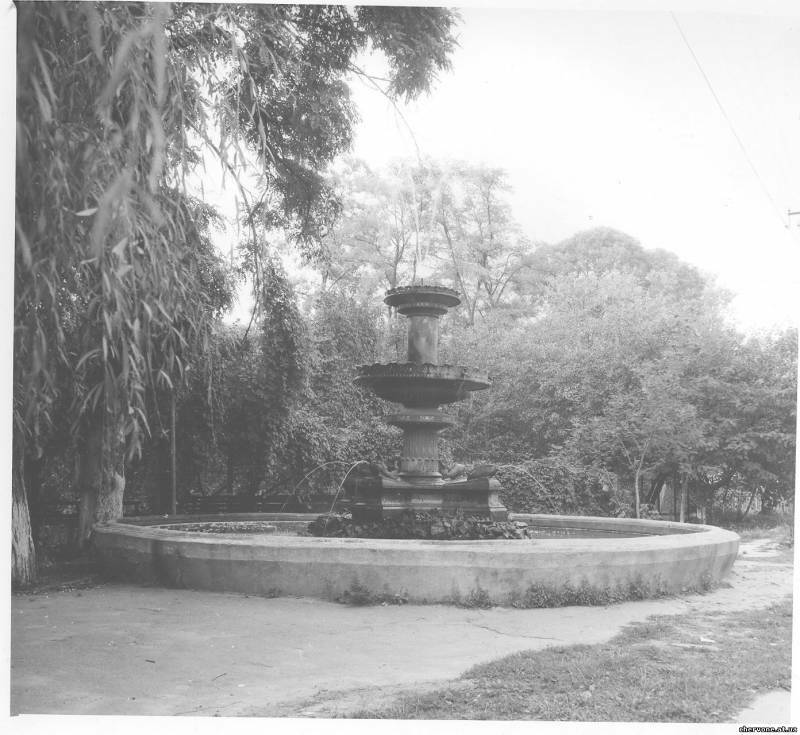 A fountain in front of the palace looks like a fragment of Middle Ages. Unfortunately, its condition shows the neglect towards art and environment occurred during the hard economic struggling years. One part of the palace is occupied by 'Svyata Rizdva Xrystova' nuns. The second part is left unattended and it looses its structure strength. The palace loses the gothic plaster; fragile reddish clay bricks are popping out from it. The park falls into decay as the old trees planted by Tereschenko have been left to the nature. But corkwood trees have still been thriving and an old linden alley keeps its unique style, reminding us about great talent of Fedir Artemovich Tereshchenko. Work is a source of existence for people and people create many wonderful things. Cimbalist Victor Petrovich (born and grown in Chervone) dedicated his life to the art of drama and had spent many years of his life on the stage of drama theatre in Zhytomyr city, named after I.Y. Franco. His colleagues say: " He was exemptionly talented. Presumably, he was personally blessed by God..."
Bogaychuk Valentin Ivanovich is a former student of our school. Presently, he is a deputy of general designer of ANTK, named after Antonova. Bodnarchuk Leonid Ivanovich is a director of Bee-keeping Institute, named after P.I. Prokopovicha. He is a president of Bee-keeping Union of the Ukraine, a professor, and a corresponding member of Academy of sciences of the Ukraine. He was born to the repressed parents who were sent to isolated distant Siberia. After graduating from Agriculture Academy he worked as a zoo technician on a farm «Buchanskiy». He worked at the beekeeping research at the Institute of zoology. After his remarkable dissertation L.I.Bondarchuk became the first director of the first Ukrainian Institute of bee keeping. He is an initiator of creation of national museum of beekeeping. His advanced study in industry of beekeeping brought glory to Ukraine. He is an author of seventy works that had been published at home and abroad. His friend and coauthor, P.I.Kharchenko, became his partner and they researched the maintenance and use of bees in lighthouses, pollination of cultures, flying abilities of bees, development of different breeds of bees, development of methods of maintaining them and much more. As its result the science got new discoveries and formed the law in beekeeping. Bee-practice got concrete scientific recommendations in relation to the work with bees. 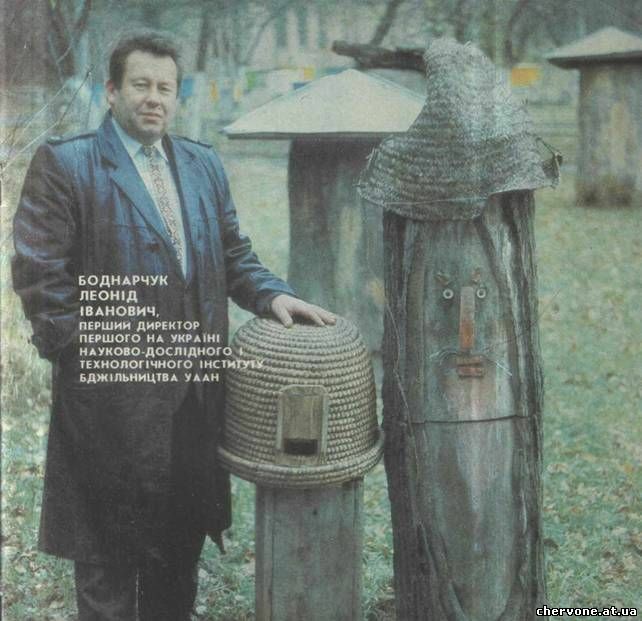 When L.I.Bondarchuk attended our school, he gave us his collection ''Work in bee-keeping'' and it has been stored in our museum. Leonida Ivanovna Dyusenbaeva is a former student and a teacher of Chervone's school. She publishes her poetry in the local newspapers and, also shares them with us. She is a desired and frequent guest in our school. Shynkaruk Volodymyr Fedorovych is the Ukrainian famous author, song writer and performer; a popular programme presenter; a professor in Zhytomyr Pedagogue University, named after I.Y. Franco. He is a former pupil of our school, too. His creative collections enriches our museum and are great example for the students. It's pity that the days are count. And love, such deeply in my heart! To flame the fire of beginning. This site has been created by the initiative of Petrichenko Yuriy Oleksandrovich. With questions, ideas and suggestions, please contact us through Reverse connection part. The article was translated by Oleksandr Shynkar under the direction of Olga Melnychuk.